"Oh, goody! A new one by Jon Scieszka!" I thought, as I picked up a copy from the display. I thumbed through it. I wasn't amused. The illustrations looked weird, and not at all Lane Smith-ish. But then I remembered my experience with Don't Let the Pigeon Drive the Bus. I didn't fall in love with that book until I read it to children. So I bought Cowboy and Octopus, and last week I read it to my fourth graders. It's hysterical. The illustrations are perfect. The kids were rolling on the floor laughing, and I would have been, too, but I was wearing a skirt. The chapter? story? where Cowboy hits Octopus on the head with a hammer is my favorite. I had to go back and reread it before the kids got it. Octopus says something like, "I'm going to hold all these pieces together and when I nod my head, you hit it." Bad sentence construction results in hilarious confusion over "it." I think the kids liked the scary tooth fairy Halloween costume the best. Or maybe the page with the photographs of the beans. "Those are real beans!" someone said, and not a half a breath later came, "Beans, beans, the musical fruit..."
Scieszka should win a Pulitzer Prize for his ability to channel his pre-teen self and the accompanying sense of humor. I also read aloud Those Shoes. (I reviewed it here.) It, too, was a hit. I held up the book, and just based on the cover, my students knew pretty much what the story was about. They'd all been there, wanting something they couldn't have, or not having what everyone else seemed to have and feeling left out. They were surprised by, but completely satisfied with the ending, and they were sure that the main character had done the right thing by giving Those Shoes that didn't fit him to his friend whose feet were smaller than his. The next day, a student in another class came to school wearing a pair of way-cool orange sneakers. I was holding the recess door as the students came in from lunch recess, and as the end of my line passed by me, this kid was leading the next line of students. I complimented his shoes, which caused the last few kids in my line to turn around and look. I looked at my kids and they looked at me. I pointed and said, "Those Shoes!" and they nodded and replied, "Those Shoes." So in one day, this book went from story to insider lingo for a coveted article of clothing. Not bad. Not bad at all. Last week was a darn good read aloud week in my classroom. How to Steal a Dog (review here) is up next. 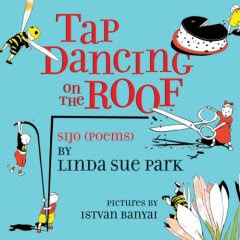 I am TOTALLY in love with this new poetry book by Linda Sue Park. From the inside flap, I learned that sijo is a type of poem that originated in Korea. It is "kind of" like haiku, but not quite. It has a fixed number of stressed syllables and is usually 3 or 6 lines. The big fun is that there is some unexpected twist or joke at the end of each one. I am anxious to share this book with my class. They had SOOO much fun with Haiku once I shared DOGKU by Andrew Clements that I am pretty sure they will have fun with this one too--I am anxious to see what they do with the twist endings. I am all about finding books that help my kids really have fun with words and language. That's was why I was so excited when I found this new one! Poetry Friday round-up is Amox Calli--enjoy! The catalogs have started to come. The displays are starting to edge out Halloween and dwarf Thanksgiving. This is a simple story of a girl who wonders about and worries about the organ grinder and his monkey who show up on the corner of the street below her window. She questions her mother, Where do they sleep? How do they stay warm?, but her mother is too busy getting the girl's angel costume ready for the Christmas play to give her a satisfactory answer. On the way to the church for the Christmas play, the girl puts a coin in the organ grinder's box and invites him to come to her play. The story holds its breath when the little girl takes the stage to deliver her angelic lines. She surveys the crowd, but does not see the organ grinder. When he enters the church, she shouts, "Behold, I bring you tidings of Great Joy!" Like I said, it's a simple story. It's a story that mirrors the story of the Nativity -- of the poor outcasts who are invited to be witnesses to the Great Joy. Of the angel who invites all to share in the joy. The illustrations are what gives this book layering and depth. The setting is WWII. You can see it in the cars, the hair and clothing styles, the fact that there are no young men in the church. The girl's father is in the Navy. His picture is on the dresser. (Is his absence the reason Mother is distracted?) Every picture in this book glows, is radiant, is luminous. Every face in this book is a particular face, every person seems to be caught mid-gesture. After the story is over, you can't help yourself -- you go back and look at the pictures, again and again. I am a huge Jonathan Kozol fan. I had no idea that he has been on a partial fast since July as a way to protest NCLB reauthorization. I read about it this week in the Boston Globe. I am currently reading Kozol's new book, Letters to a Young Teacher. Like of all of his books, it is quite powerful--whether you are a new or experienced teacher. For those of you who weren't around for CYBILS last year, it was quite a fun thing! Bloggers choosing award winning books in several categories. 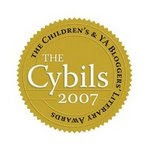 The CYBILS list is still one I go back to for great titles. I would highly recommend spending some time on the site as we get ready to go! A really fun thing to be a part of! Poetry Panels have been announced. Franki is judging. Go Franki! I am so pathetically behind in blog reading. How far behind am I, you ask? I just went to Bloglines for the first time in I Don't Know How Long, and I was stunned by the bloggy productivity of you all! The King of All Bloggy Productivity goes to Sam Riddleburger with 87 posts since the last time I checked Bloglines! It's mind boggling...the alternative Harry Potter endings, the Rubik's Cube solving, the juggling video (great music, and I love the slo-mo at the end), the reviews of obscure books...All I can say is, WOW! The Candy Blog (82 new posts) just barely edged out Fuse #8 (80 new posts) for first place. Good thing I looked, The Candy Blog has a contest going on -- she's giving away candy! Go check it out! No Video Sunday for Fuse this week, but good for her -- she gets a vacation! In second place, with 65 posts, is Two Writing Teachers. They have so many great ideas for writing workshop that it almost gives me hives (but in a good way -- in a "stick your neck out and try something new" way). Everybody else who's in double digits, you have my deepest admiration! If you didn't find your blog in this post, it's not because I don't read your blog, it's because I've come to the end of the hour that I allotted for doing this penance. I'm going to Bloglines as soon as I post this, and I'm going to click the "Mark All Read" button and start over again fresh. I'm not much of a fashion maven anymore. I like what I like, and I buy what fits comfortably. It's my money, so I get to decide when I say I can and can't have something. But I certainly remember what it was like to want and what it was like when Mom tried to explain away my hunger with talk of need and price. I remember my desire for a shirt with a little alligator on it, for a particular pair of lime green pants, for go-go boots. Maribeth Boelts captures the struggle between need and want perfectly in Those Shoes. Jeremy wants more than anything a pair of black high-tops with two white stripes. Everybody has them. Everybody except him and his friend Antonio. When Jeremy's shoes fall apart, the guidance counsel0r gives him a pair of shoes that close with velcro and have "an animal on them from a cartoon I don't think any kid ever watched." Jeremy tries and tries, but he can't make the new shoes work for him. Then he notices that Antonio's feet are smaller than his and he knows he has a way to make his friend happy. In spite of my remembered desperate childhood fashion wants, there are some huge differences between me and Jeremy -- I never wore clothes until they fell apart at school, I was never given a pair of shoes by the guidance counselor (or some equivalent because we didn't have such a thing), and we didn't shop at thrift shops. So I'm wondering if perhaps I only understand this story in a very surface sort of way. And as I look back at the illustrations, I wonder about the other story this book might tell. Jeremy is black and lives with his grandmother. There are blacks and whites and Asians (and a girl) who have those shoes, but Jeremy who is black, and Antonio, who has a Hispanic name, don't. The guidance counsellor appears to be white. Maybe I'm making too much of this. Maybe it's reality, get over it. Maybe it's just a story about wanting versus needing and getting versus giving. See what you think. I found this poem at Poetryfoundation.org. Round-up this week is at ReadWriteBelieve. The Monday Poetry Stretch at The Miss Rumphius Effect is blues poetry. Tricia listened to blues music to get in the mood to write. The recommendation from The Teachers & Writers Handbook of Poetic Forms is "think of something that depresses you." I started to write a self-serving, whiney poem about too many meetings that each generate more work to be done and yet eat up all the time in the day in which that work might actually get done. In some parts of the city. a model based on GROWTH. And see who GAINS the most. *AYP stands for Adequate Yearly Progress. It is part of No Child Left Behind. The name is misleading. AYP does not really measure progress, it measures the ability of children to get a certain score on a single test. Children take the test whether or not they are fluent (or even proficient at a basic level) in English. The bar is the same height for children who have had all the advantages of an affluent home life, and for children whose only two meals of the day are the free breakfast and lunch they receive at school. Researchers are able to predict with 95% accuracy which schools will not make AYP based on such factors as poverty levels, and number of English Language Learners (ELLs). A more sane approach would be to measure student learning with a pretest at the beginning of the year and a posttest at the end of the year. Teachers should be required to make sure that every child achieves a year's growth in a year. This would actually be more challenging for teachers in schools that easily meet AYP. Their students are already so close to the bar that it's no stretch to make it over. If they had to make a year's gain in a year's time, those students would really have to stretch for once. I was supposed to be at the health club swimming. I was supposed to be at school putting up bulletin boards and dissecting the Social Studies Standards. I was supposed to be folding laundry. Instead, I was standing at the sink snipping basil leaves from basil stems. Endlessly. I should have taken pictures so you could see just how many leaves there were on my four basil BUSHES this year. Suffice it to say, I made six batches of pesto. Six food processors full. Six containers of distilled summer, captured and preserved on this crisp hint-of-fall day. As I snipped and washed and packed and ground and glopped and slopped, I had a lot of time to think. I thought about summer and photosynthesis. I thought about fall and endings. I thought about winter and snow. Thoughts of snow turned to thoughts of Robert's Snow, and the enormous amazing outpouring of support for Grace Lin and her family and all those whose lives might be touched by the cancer research at the Dana-Farber Cancer Institute. I feel like I live in parallel worlds. In the one that is most tangible, strangers rarely reach out to strangers. Yet in the world behind and beyond my computer screen, connections that start as invisible electronic impulses become a web of heart strings that give me hope for humanity. "This year, more than 200 well-known children’s book illustrators from around the world have been given a five-inch wooden snowflake to decorate at will. Like actual snowflakes, each design is unique. The 2007 online auctions for bidding on these hand-painted snowflakes will take place in three separate auctions, open to everyone, from November 19 to 23, November 26-30, and December 3-7. You can read here for more information. What we in the kidlitosphere community want to do to help drive traffic to the site for this year’s auctions and help raise money for the cause is highlight at our blogs the illustrators who have created snowflakes for these upcoming ’07 auctions — as well as post the unique snowflakes they have made (one at a time at each blog, which the DFCI has graciously given us permission to do), ultimately driving as much traffic as we possibly can to the Robert’s Snow online auctions." "In many ways, the nation's history can be read as a struggle to embrace who 'We the People' are." Here are some books and web links to help you plan your recognition of one of the greatest documents in human history -- The Constitution. Historical fiction from the point of view of James Madison's aide during the Constitutional Convention. The Preamble in kid-friendly language. A fun and fact-filled account of the Constitutional Convention of 1787. Illustrated by Tomie dePaola. An A-Z trip through our country's democratic form of government. The story of the signing of the constitution in question/answer format. An excellent, well-balanced version of the story of the constitution. This beautifully illustrated 1987 classic is out of print. Check your library for availability. A huge collection of links for Constitution Day. From the U.S. Constitution Online comes this EXCELLENT site which translates the Constitution into kid-friendly language. The link is for K-3 students, but you can navigate to versions for older kids from this page. Constitution Day activities for the Anti-Bias Classroom. Lessons and links from the group that founded Constitution Day. Lessons from the National Archives site. Lessons from The Bill of Rights Institute site. Even if you're completely overwhelmed by ARCs and review copies, you gotta admit: your heart beat a little faster this week when the L.L. Bean Christmas catalog came. oh, UPS Man, let's hop in your clean brown truck and elope ! The rest is here. Round up is at Hip Writer Mama. Two new characters you really can't live without! Educating Alice has a powerful post remembering September 11. I haven't spent as much time as usual reading professional books. But the ones I have read are great. These are the 5 that I have found the most helpful for my literacy teaching. I highly recommend all of them. Smart Answers to Tough Questions by Elaine Garan, in my opinion, is a book that we all need to have on our shelves. For anyone who is teaching well in this climate of testing and politics, this book reminds us of the reasons we do what we do in our classrooms. Garan also gives us research for further support of our work. Adolescent Literacy by Kylene Beers, Robert Probst, and Linda Rief gives us the best thinking from the best thinkers in the field on adolescent literacy. Although I teach grades 3-5, this book is applicable to all that I do too. Mentor Texts by Lyn Dorfman and Rose Cappelli is a great new book on ways to use great children's literature in our writing workshops. Don't Forget to Share by Leah Mermelstein is a great reminder on the importance of share time in writers' workshops. This is a great book on how to take advantage of the teaching possibilities during share time. The Reading Zone by Nancie Atwell brings us back to the original intent of the readers' workshop. We want kids to fall in love with books and to become lifelong, passionate readers and learners. NYC Teacher is looking for submissions for the next Picture Book Carnival at Mentor Texts & More. Deadline is October 5. Beth at Cover to Cover recommended this book to me. It is a great fairy tale where we come to know favorite fairy tale characters in new ways. Similar to the SISTERS GRIMM series, the reader gets an inside look at fairy tales although this book has a bit less humor and a bit more depth than other fairy tale takeoffs that I've read. The concept of this one is great and the characters are quite believable. This one may have been the most enjoyable read for me in terms of middle level novels. It is really a fun book. So much is combined from some of my favorite reads--a child who isn't getting lots of attention from her parents, a mean nanny, magic and friendship. It is a very unique story told in a way that makes it fun and suspenseful. A New Llama Llama book! So very exciting! I wasn't going to buy it but when I read it and realized that it clearly explained the experience of grocery shopping with cranky children, I had to have it. This one ends a bit pleasant--everyone leaves the grocery store happy, but something to shoot for, I guess. I want to send a copy to the mom who sold the Pokemon cards that her kids snuck into her cart at the grocery store. Did you read about it? Her blog is quite a hoot too! I am always looking for great books with simple text--predictable text that support new readers. I found a great one yesterday! It is called FIRST THE EGG by Laura Vaccaro Seeger. This is a simple text that follows a simple pattern..First the egg then the chicken. First the tadpole then the frog...and so on. The painted illustrations are very engaging and each includes a cut out so that adds a little surprise to each page. A great addition to any K-1 library as well as a great book to include in a study of life cycles. I added several poetry books to my classroom library collection this year. The following are my absolute favorites. Shout! : Little Poems that Roar by Brod Bagert--is a fun book for reading aloud. The colorful illustrations add to the fun. My students have been having a great time reading this one together on Poetry Friday! Here's a Little Poem by Jane Yolen--a favorite book for readers of all ages. This one would be a great gift for young children but it also has great poems for older readers. The illustrations are quite happy! This one seems great for all elementary grade levels. DOGKU by Andrew Clements--I loved this one by Andrew Clements because it is a story about a sweet little dog told in Haiku. I loved the whole concept--it was a great story told completely in haiku--even the author blurb and the front flap follow the haiku theme! This is a Poem That Heals Fish by Jean-Pierre Simeon--I am sooo happy I found this poem. An amazing book to start conversations with students about what poetry is and what it means to different people. For more "BEST OF 2007-So Far", visit Mother Reader. Mother Reader had another GRAND idea. She's invited us all to think about and post our "Best of 2007--So Far". It is a great opportunity to look back at the reading from this year and reflect on those books that stayed with us, those that we love and those that we hope win some award when the awards come out. THAT SPECIAL LITTLE BABY--I have a hard time finding new books that make great baby gifts--that would appeal to both baby and parents. But this one meets that need. A great story about a new baby and how she grows and how much she is loved. TAKING A BATH WITH THE DOG -AND OTHER THINGS THAT MAKE ME HAPPY-by Scott Menchin--I love this one for lots of reasons. A great story to share with children, a great book to help students think about writing ideas, etc. THE BIGGEST THING IN THE OCEAN by Kevin Sherry--The simple text, bright illustrations, and large size make this a fun book that kids are drawn to. The surprise ending is quite a treat! ORANGE PEAR APPLE BEAR by Emily Gravett-I think that this book is brilliant. How an author created a book with 4 words and surprising illustration is amazing. 17 THINGS I'M NOT ALLOWED TO DO ANYMORE by Jennifer Offill--This has been a favorite since my daughter introduced it to me. It makes me laugh every time I read it. And the illustrations include real artifacts in the background. I am not sure which age this book would appeal to but I LOVE it! GOLDILOCKS AND THE THREE BEARS by Caralyn Buehner--I do not usually buy new versions of traditional tales but the cover of this one caught my eye. Something about the bears' expressions makes it a version I needed to have. Goldilocks is quite adorable, in a devious kind of way. And she jump ropes throughout the books which adds to her character a bit. Poetry Friday, Root Canals, and... a CONTEST! evaluation. So, I started to write these to amuse myself while I was accepting the fact that I am old enough for a root canal. I thought it might be fun to try a FIB and I went from there. Is it cuz I’m forty plus? Did you know an abscess is a glob of puss? Then I wondered if I could write a limerick, or some other form of poetry about root canals. Imagine the possibilities! Then I figured it might be more fun to have a contest. (We have never run a contest, but we have loved the contests that Lisa Yee, Three Silly Chicks, and Mother Reader have run. So, choose any form of poetry you like. Write a poem in that form about root canals. Submit it in the comments. We will announce and post the winning poem for next Friday's Poetry Friday post so you have until Thursday night--September 13th. 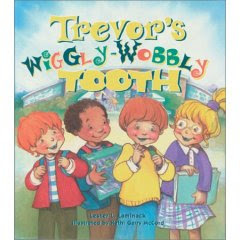 an PERSONALIZED, AUTOGRAPHED copy of Lester Laminack's book Trevor's Wiggly-Wobbly Tooth (okay, so there are not so many children's books about root canals, but this is a great picture book and it IS about an issue with one's teeth!). Amuse me before I go to the specialist for a more thorough evaluation! As you know I am not a huge fan of using solely leveled texts in classrooms of K-1 students who are learning to read. I love leveled books by The Wright Group, Rigby, Seedlings, etc. but I worry when the entire classroom library is filled with ONLY leveled books and no children's literature. But I know how important it is for kids to have books that they can read on their own successfully. So, I have been on the lookout for books that support new readers just as leveled books do, but that aren't published just because they meet certain "level" criteria. Below are two great new books I just found that would be perfect for K-1 classrooms. I know that leveled books fill a need for our new readers but I believe strongly that our youngest readers need more than a diet of leveled books. So here are two new ones I found. Big and Little by John Stadler is a lift-the-flap circus story. The text is simple and the flaps are sturdy. I think this is one of the few lift-the-flap books that could survive in a classroom. The story is fun and the illustrations keep you in suspense. A "big" elephant is trying to dive into a "little" glass of water. Can she do it? You'll find out if you read to the end! The flaps, the predictability, the illustrations, and the simple text make this perfect for new readers. Pat Hutchins seem to really understand young readers. Her text and illustrations always go together to create an amazing story. In this new one, a barn full of mothers decide to dance a bit while their babies sleep. Lots of trouble comes and the ending is a fun one that readers will like. There is lots of rhyme and rhythm in this story and the illustrations make this a fun story that children will enjoy. I usually begin my read alouds with picture books and then move to a short easy novel before I start reading books that might be at or above my students' reading levels. Lots of my students haven't read all summer long, and I am modeling what they need to do to rebuild their fluency and stamina: start with lots of quick, easy reads to build confidence and refresh skills. It's the first day of school for Jack and Annie, and Jack is his typical worry-wart self. Luckily, time freezes in Frog Creek, PA when Jack and Annie travel with the magic tree house, because 10 minutes before the first day of school, they travel to Florence, Italy to meet Leonardo da Vinci and try to learn another secret of happiness to help Merlin. At first, da Vinci tells Jack and Annie that the secret of happiness is fame. But by the end of the book, he has changed his thinking. He realizes that the secret to his happiness is curiosity. Jack and Annie get back to Frog Creek at the moment they left, and they run to school filled with eager questions rather than nervous questions about the beginning of the school year. In early August, a post at Creative Literacy caught my eye -- Picture Books About Books. Our list of Books About Books and Reading has been sitting over there in the sidebar along with 100 Cool Teachers in Children's Literature just waiting for some new additions. So, here's the list! Let's look again. Do any new books come to mind? What kinds of conversations do these books spark in your classroom or library? Check this out, too: A Notes from the Windowsill annotated bibliography of book-books by Wendy E. Betts.